Our VitaBug Cricket Protein Powder has been specially created to provide a fantastic source of environmentally sustainable, digestible protein. We have spent years formulating a special diet to feed our crickets, so that each mouthful contains as many essential nutrients as possible. The result is a 100% natural protein product, which contains 100% ground crickets...and nothing else! Our Crickets are farmed and processed right here in Australia! And contain the only species of crickets approved for human consumption by FSANZ. The Cricket Protein Powder is specially dried and milled so that it is as fine as regular flour. The resulting powder is very versatile and can be used to add extra nutrients to many sweet and savoury dishes. This product comes in a resealable stand up pouch with 10 x 20g serves. That work out to be just $3.50 per serve (and you get more protein than a 200g steak). 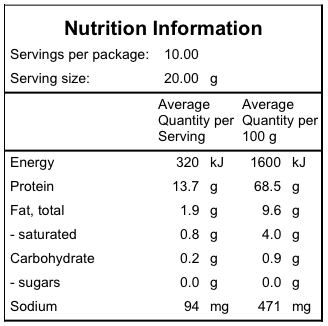 Each serve of cricket protein powder has 13g of protein. Each 20g serve of cricket super powder contains over 13g of digestible protein as well as calcium, iron and heaps of other essential micronutrients. It also has lots of B12 and B2 Vitamins and 3 times the amount of Omega 3 as salmon. It also has no added salt and no added sugar. Take a look at our recipes section for ideas on how to use the cricket powder in your everyday cooking. Enrich the foods you eat everyday with this wholefood, alternative protein. Please see our recipes page for ways to use your powder. Please note- You can not use this as a replacement for wheat flour. Allergen Information: People who have a SHELLFISH allergy should not eat edible insects. You can have a similar reaction.